College recruitment events are unique opportunities for employers. Unlike sorting through online applications, at campus events, recruiters get the chance to speak to dozens of eager potential job applicants in person. This not only makes it possible to associate a face to a name right from the start, but helps recruiters better determine if a job seeker is a good fit based on direct conversation. The National Association of Colleges and Employers (NACE) finds that employers plan to hire 5.8 percent more new graduates in 2017 than 2016, which means this year, keeping up with your college hiring competition may mean investing in some new recruitment strategies. We’ve got a few. Nobody likes to feel like they’re on the receiving end of impersonal content. Yet recruiters with too little time and not enough resources are sometimes left with no choice but to keep candidate communication generic. With a strong candidate relationship management software (CRM), recruiters can create and deploy pre-event and post-event campus recruitment communications, to stand out with content that’s specific to the new job seeker experience. Create email templates specific by college name or direct job seekers to a career portal that’s exclusively focused on college hiring. Let’s just say it: paper doesn’t belong at college recruitment events anymore. While some students will inevitably arrive with resumes in tow, giving them the option to share their information digitally—via a mobile tablet that syncs with your recruiting software—is a way to both impress and offer convenience. Plus, it gives recruiters the ability to review and manage candidate profiles right from the event. How you follow up with job seekers is just as important as how you interact with them in person. Follow-up often depends on sorting through candidates after an event—a process that can be all the more challenging when an event is well-attended and it’s difficult to remember conversations and first impressions. Was John M. the one I thought would be great for this job? Or was it the other student who mentioned they were majoring in political science? To avoid delays and get in touch with job seekers sooner, find smarter ways to informally screen candidates at the event. CRM software can make it possible to quickly give a candidate a thumbs up or thumbs down when viewing their profile on your mobile tablet at the event. After you speak to someone that seems like a good fit, give them a figurative “thumbs up” so you won’t forget! What about those that aren’t ready to apply for a job quite yet? Maybe they have another year of school to go, but want to know about your future openings. Or maybe they’ll hire with another company, but would consider yours down the road (the average person will change jobs over ten times in their career). Find ways to make campus recruitment events meaningful for those students, too. With CRM software, job seekers can supply their resume and interests, or share their social media profiles, and in turn employers can use their CRM to distribute email job digests to keep candidates aware of new openings and company updates. 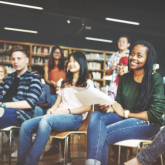 Employers can create different groups of these passive candidates, such as a group just for university hires, so that content can be tailored to specific needs and interests. Participating in college recruitment events do cost time and money, which is why it’s useful to measure an event’s success and determine how future events could be more effective. Through your CRM software’s reporting features, gain a quick view into metrics like total number of attendees, total number of applicants, and total number of hires sourced from a specific university over time. If a certain campus doesn’t seem to have the right pool of talent, it may be time to focus your efforts on another. For more tips on how to make the most of your college recruiting efforts, don’t miss our April Job Fairs Bring May Hires.